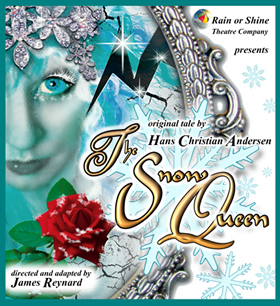 rain or shine theatre company is proud to present this christmas an enchanting tale of friendship and adventure based on hans christian andersen’s classic story, sure to delight and enchant the whole family. once upon a time, a naughty goblin made a magic mirror that only reflected wickedness and ugliness in people, but it was broken in to billions of pieces, and scattered around the world by the wind. on her journey, she meets a host of colourful and lively characters; are they helping her, or hindering her, and will she reach kai before his heart is lost forever to the queen of winter? suitable for ages 6 to 106, rain or shine is proud to present an enchanting tale of friendship and courage, based on hans christian andersen’s classic story, sure to delight and enthrall the whole family.